The maiden flight of the Airlander 10 took place on August 17th from the historic Cardington Airfield in Bedfordshire. The helium-filled craft aims to kickstart a new age of the airship. At 92m long and 43.5m wide, this is the world’s largest aircraft, dwarfing heavyweights such as the Airbus A380 “superjumbo”. It is cheaper, too, with a price of £25m, compared with $375m (£287m) for an A380. It can also carry a 10-tonne payload, comparable with military transport helicopters such as the Boeing CH-47 Chinook, the US Air Force’s workhorse of choice. Potential uses include tourist pleasure cruises, cargo transport and disaster relief. "The first flight of Airlander 10 is a historic success and marks the commencement of Airlander 10’s Flight Test Programme which is expected to last for a number of months. After which the aircraft will begin a series of Trials and Demonstrations with prospective customers". 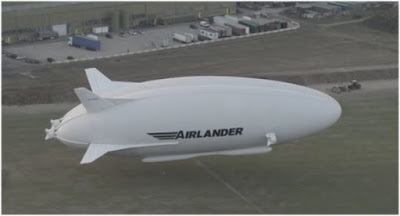 Customer interest is strong due to the game-changing capabilities of the Airlander – it offers a stable platform with huge amounts of power and space for search & rescue or communications equipment, and also offers a unique passenger experience. Chief Test Pilot Dave Burns said, "It was privilege to fly the Airlander for the first time and it flew wonderfully. I’m really excited about getting it airborne. It flew like a dream." maximum speed of 35 knots. Due to a later than anticipated take-off time the Airlander was limited to a 19 minute flight so we could land safely before darkness fell.